Cathy works on galaxies and clusters of galaxies. She is interested in clusters as such, but also as cosmological probes. Her expertise is in the submm-to-radio part of the electromagnetic spectrum. Such observations reveal the physical conditions of galaxies and of the intra-cluster plasma. She also has a strong interest in theory and modeling - see her recent paper on helical magnetic fields. 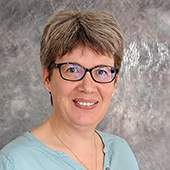 Since April 2014 Cathy is the Director of the Master's program in Physics and Astronomy at Chalmers and of the corresponding Master's program in Physics at Gothenburg University. The XXL Survey: XI. ATCA 2.1 GHz continuum observations? Leve The Big Bang Theory! Sicken attans liten söt antenn! There might be more projects where Cathy Horellou participates, but you have to be logged in as a Chalmers employee to see them.